Have you heard about the challenge we've organized along with Alyson from Kid Lit Frenzy? We're challenging people to read more nonfiction picture books this year. If you would like to take part in the challenge, visit the Kid Lit Frenzy blog and add your name to the list. 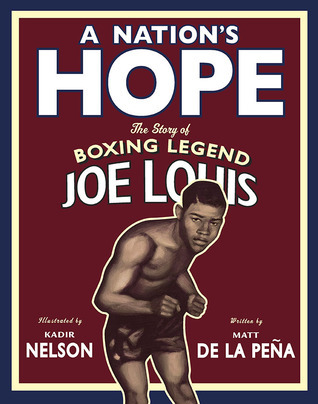 Matt de la Pena eloquently tells the story of how a young Joe Louis, who was teased for stuttering, became a world class boxer and faced off with Max Schmeling, a boxer who represented Hitler's Germany. The book focuses on the 1938 match between Louis and Schmeling and how the event brought blacks and whites together during a time of segregation in the U.S.
"It was now more than just blacks who needed a hero. It was all of America, and color was set aside." Using dark oil paints on wood, Nelson's illustrations convey the tension and emotion of the famous fight. 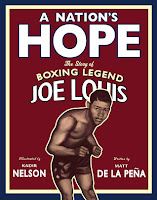 Nelson masterfully uses shadows throughout the book: a silhouette of Louis jabbing at a punching bag, a man with a pipe listening to the radio, the shadow of Max Schmeling's body on the floor of the boxing ring after he is knocked down. I have read this book several times, and I notice something new each time I pick it up. It's amazing how the words and illustrations work so well together. I read the story to a class of third graders, and they were captivated. It's a beautiful book to read aloud; it's poetic at times. The students had a powerful discussion about segregation, World War II and Hitler, however I had to provide quite a bit of background information. An author's note, timeline or list of additional sources would be helpful for young readers who lack knowledge about Jim Crow and World War II. The ALA Youth Media Awards will be announced on Monday, January 23rd. I wouldn't be surprised to see A Nation's Hope bring home some awards. 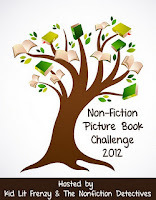 We will give away one copy of A Nation's Hope as part of the 2012 Nonfiction Picture Book Challenge. Entries will be accepted from 12:00 am on Monday, Jan. 16, 2012 until 11:59 pm on Saturday, Jan. 21, 2012. The winner will be contacted by email. If the winner does not respond within 48 hours, we will select a new winner. Thank you for the review and for the giveaway. It is a beautiful book. I was fortunate enough to get my copy signed by Kadir Nelson. Need to get it signed by Matt de la Pena someday to be complete.